Miami Valley Career Technology Center Adult Education offers a unique healthcare program in the Eye Care field titled Ophthalmic Assistant. Classes will begin January 7, 2019, at the MVCTC Adult Education facility located across from the main campus at 6800 Hoke Road in Englewood, OH. Englewood, Ohio -- Miami Valley Career Technology Center Adult Education offers a unique healthcare program in the Eye Care field titled Ophthalmic Assistant. The high demand for ophthalmic assistants, results in a nearly 100% job placement rate. The program was instituted as an Optometric Technician Program and became accredited by the Joint Commission on Allied Health Personnel in Ophthalmology (JCAHPO) in January 2018 to address the global and local shortage of ophthalmic medical personnel by training students to become Certified Ophthalmic Assistants (COA). The program includes 12 months of classroom, lab, and clinical instruction. Classes will begin January 7, 2019, at the MVCTC Adult Education facility located across from the main campus at 6800 Hoke Road in Englewood, OH (just northwest of Dayton, OH). The program consists of courses in ocular anatomy and physiology, disorders and diseases of the eye, ocular pharmacology and treatment, basic and advanced ophthalmic testing, management and workflow issues in the ophthalmic setting, and optics (including eyeglasses and contact lenses). Through lectures, learning labs, and clinical observation students will be endowed with the knowledge and skills required for entry-level positions as Ophthalmic Assistants (OA) and be eligible to sit for the Certified Ophthalmic Assistant (COA) exam upon successful completion of the program. Ophthalmic personnel assist medical doctors and surgeons in the diagnosis and care of patients. This can be a very satisfying career in which one can make a difference in the lives of patients. Skills include obtaining patient complaint and history, reading current eyeglasses, measuring for updated eyeglasses, preliminary check of pupils, ocular muscles, and visual fields, preliminary check of the ocular surface and other structures, and measuring intraocular pressure. In effect, a highly specialized medical assistant. Students are also trained in specialized testing including measurements for cataract surgery, assisting in minor surgical procedures, corneal topography, visual field testing, and ocular coherence tomography. 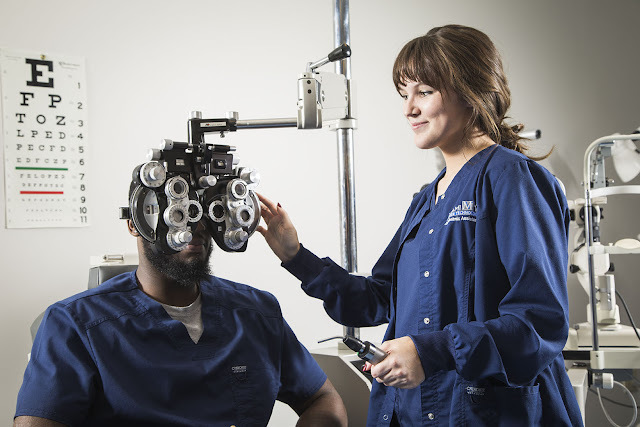 The program at MVCTC is overseen by local medical doctors, optometrists, and certified ophthalmic assistants, technicians, and medical technologists. Classes meet Monday through Thursday from 5:30 to 9:30 with clinical observations beginning in term 2 and progressing to hands-on skills. The final term includes 32 hours each week of intense clinical experiences for 10 weeks. All clinical takes place during daytime hours. Ultimately the students graduate from the program with the ability to become Certified Ophthalmic Assistants, to enter the ophthalmic workforce at a competitive salary/wage. Graduates may embark upon a gratifying lifetime career. To learn more about the program, contact Lynn Beaver at 937-529-2984 or lbeaver@mvctc.com. For more information on the opportunities offered at MVCTC, please visit www.mvctc.com.